Lift slide handle by Colombo Design LC413 series. 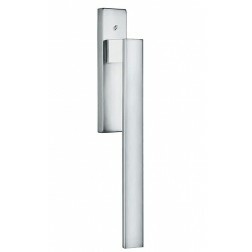 Pull handle LC413 elegant and modern, perfect environments for the next generation. Unique materials and design used by Colombo Design, who won one of the first places as a manufacturer of handles to the top of the range. 10 years warranty on all handles Colombo. The warranty can be extended up to 30 years with the Zirconium HPS finish. Colombo Design also developed a treatment of protection 30 years guaranteed on the finish Zirconium Gold and Zirconium Stainless-Steelwhere are previously coated with layers of copper, nickel and chrome in order to guarantee the perfect insulation of the underlying raw material. The use of these products is strongly recommended in such places as high-salinity marine areas subject to acid rains. The use in bright sunshine and temperature ranges does not cause color changes. The hardness of the coating and the low rate of surface friction ensure a very good resistence to scatches due to the use of rings (for example). Any dents due by hits or impact can spoil the surface and effect the coating performance. Just like a family that handles its members with love and care, Colombo Design handles its family of productions with the same values and traditions to make of any place a home, never accepting any compromise to quality and function, individuality and authenticity. Bonding heritage with creativity, curiosity and innovation. Leaders in the handles field for doors and windows since 1990, with a reference point all Italian. The long experience in the field of galvanic treatments, combined with the choice to pay special attention to the quality in production processes, enable Colombo Design to ensure the finishes of its products beyond the normal warrantly provided by law. It is therefore with great pleasure, that Colombo Design offer to her end-users the warrantly of 10 years on Chrome (polished chrome), Cromat (satin chrome),Oroplus (gold polished), Vintage (polished bronze) and Vintage Mat (Matte bronze). Colombo Design think Green made, Each Design and production step is carefully checked with regards to the enviromental impact and each following decision is taken if our eco-compatibility objectives are fully reached. This means that when we manufacture our products, the Green Made concept by Colombo Design will be assured by the advanced technologies and very strict controls carried out by a very highly qualified personnel, generating a product conceived constantly thinking of the environment. The seriousness and professionalism, the enthusiasm and the desire to get in the game constantly, are the hallmarks of this company making it competitive and a leader in her sector. Specializing in designer handles and accessories unique in the genre. Also the handles are certified for a correct operation lasting for years, obviously following the correct procedures of maintenance and cleaning.